Eastern sycamore, or as it is also called, chinar, is considered one of the most perennial trees. A symbol of endurance, pride and longevity, it can live up to 1000 years. 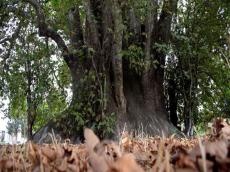 However, residents of Kolair village of Samukh region are sure that this tree is one and a half thousand years old. There's all sorts of legends and myths around this sycamore tree. One of the legends says that the place where the village stands today was visited by the Holy Imam Ali (who was the first of the Shiite imams, the fourth righteous caliph, cousin and son-in-law of the Prophet Mohammed) who lived in the seventh century. People believe that the trace from the hoof of his horse named Duldul has survived to the present day on the trunk of a plane tree. Over time, the tree began to be honored as sacred, pilgrims began to come to it, and the people began to call it, like the horse of Imam, Duldul. According to another legend, Hazrat Ali visited Azerbaijan and tied his horse in the shade of this tree. Pilgrims make a wish, tie shawls, pieces of cloth to branches if their wish comes true. They come back here, and bring gifts. Associate Professor of Azerbaijan State Agrarian University Arif Gaziyev spoke about the sycamore tree from a scientific point of view.In an interview with Sputnik Azerbaijan, he said that sycamore tree, whose Latin name is Platanus Orientalis, is really considered a long-liver. "Chinar has always been distinguished by its forms, magnificent views. For our people, it has always been sacred, therefore it was considered a sin to burn or cut down. In the Ganja region, they call it "Khan" for its majestic and proud look," he noted. After examining the diameter of its trunk, experts concluded that it is not one and a half thousand, but about 700-800 years old. Platanus is a genus consisting of a small number of tree species native to the Northern Hemisphere. They are often known in English as planes or plane trees. Some North American species are called sycamores.